This homemade lemonade recipe is going to teach you how to make real lemonade without high fructose corn syrup and all the other artificial sweeteners you see in store bought products. This homemade lemonade recipe is easy, and quick to put together. There truly is nothing like an old fashion, fresh squeezed glass of lemonade. It reminds me of when I had my own lemonade stand when I was a kid. My brother and I built a little stand on our driveway, squeezed up some lemons, added sugar and water and sold glasses of ice cold lemonade for 25 cents. Why Make Lemonade From Scratch? Because it tastes so darn good for one thing. Have you ever eaten a homegrown tomato? Do you find it hard to go back to store bought? How about canned pineapple? I don’t know about you but once I tried a fresh pineapple there was just no going back to canned unless I was pretty desperate. Fresh squeezed lemonade is like this. That artificial stuff just doesn’t cut it anymore. And when it’s this easy, there’s no excuse. Lemons do have health benefits. Fruits and vegetables that grows from the ground are naturally good for you. Lemons are chalk full of vitamin C and vitamin A and B’s in smaller amounts. The lemon also contains good amounts of calcium, potassium, and phosphorus. Even though we think of a lemon as acidic it is in fact alkalizing to the body which can aid in digestion. It is also considered to be anti bacterial and anti viral. So make yourself a batch of real lemonade when considering summer drinks for your next party or anytime. I have found that the best way to store lemons is in a zip lock bag with as much air expelled as possible and kept in the refrigerator. This will keep the lemons for 2 maybe 3 weeks, but I think it depends on what stage of ripeness you buy your lemons. That tree over there is my Meyer lemon tree in my backyard. I love picking fresh lemons from this tree. Another way to store lemons or rather lemon juice is to squeeze the juice and then pour it directly into an ice cube tray and then freeze. Once frozen you can move the lemon cubes to a zip lock bag and they will keep for a long time. This way you will have fresh lemon juice available for other recipes whenever you need it. This is great to do when you see that your lemons are starting to go bad and you hate to waste them. Juice and freeze and there is no waste. Want to keep from watering down your lemonade with plain ice cubes? Let me show you how. Double the batch of this recipe. Then pour some of the lemonade into ice cube trays and freeze. Serve the lemonade in a pitcher and add the lemon cubes and your lemonade will stay as strong and flavorful as when you first make it. This is especially good for entertaining when you are making a big batch. Meyer lemons would be my first choice because they tend to be sweeter than the other varieties but really any lemon will do for lemonade. 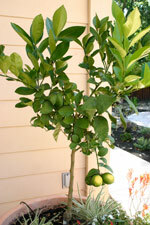 I have an improved Meyer Lemon tree in my backyard in a container, so I will definitely be using those when I get some. As you can see I have a few lemons on the tree now. I can’t wait! First make a simple sugar. Mix the sugar and the 1 1/2 cups of water in a sauce pan over medium low heat. Stir until the mixture becomes clear and the sugar is completely dissolved. Set aside to cool. Juice the lemons to make 1 cup of juice minus any seeds. You can use either an electric citrus juicer, a hand held lemon squeezer, citrus reamer, or a manual lemon juicer. Pour the lemon juice, 3 cups of cold water and about 3/4 to 1 cup of the simple sugar into a pitcher. Stir. Taste and adjust sugar as needed. Add lemon cubes and slices of lemon to the pitcher and serve. It’s really very easy to make strawberry lemonade. Just take the above recipe and add fresh strawberries. Rinse and remove the green stem or core of each strawberry. By the way, you will need about a cup and a half of fresh strawberries. Place the strawberries in a blender and add 2 tablespoons of water and blend for a few seconds until you have strawberry puree. Place a fine mesh sieve over a bowl and pour the puree into the sieve.Stir with a spoon to get the mixture through the sieve. Toss out any remaining seeds. Then pour the strained strawberry puree into your lemonade mixture and stir or shake. That’s all there is to it and it’s delicious. You can also make this variation with other fruits as well. Try your own homemade lemonade recipe by experimenting. Here are a couple of examples to try: raspberry lemonade, blackberry lemonade, watermelon lemonade or any another combinations you can think of. Lemonade is a great summer drink to enjoy with our Mexican recipes. Enjoy!